The largest of the galleries is a dimly lit space. The displays on the walls act as mini stage sets, a spotlight rectangle of text and image. 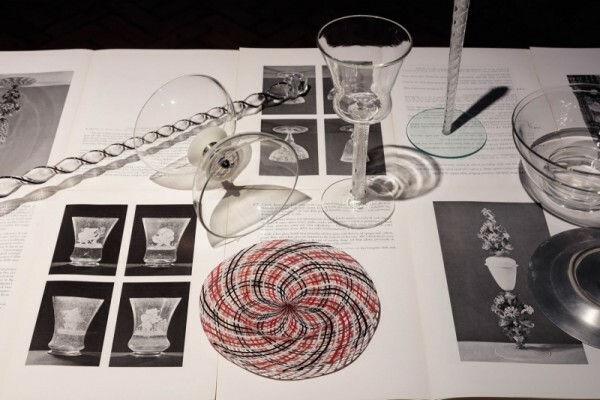 Each piece bears the resemblance of a page from a document; a scribbled hand-written note in pencil, arrows, and numbers set alongside a photograph of, for example, a piece of hand-blown glass. The references and connections are puzzling and the visual content is spare, but the care in which these wall works have been chosen suggests that there are great depths of nuanced meaning. By drawing the eye to closely observe the detail the subtle connections and resonances, the fragments and pairings begin to speak for themselves. Entering and sitting in the darkened space is a welcome relief from the noise of the private view taking place in the bar downstairs. These are the elite intellectuals, uniformly clad with just a slick of bright red lipstick and carefully ruffled hair. For although English’s work is highly personal it also creates an intimacy between herself and the viewer, creating a dynamic and open conversation. Scattered in the centre of the room the upright chairs are randomly placed but offer an invitation to sit and listen. Restless and circling, moving from corner to centre, centre to corner and around again a libretto for singers and percussion is in full swing. Lost in Music is a meditative composition in which some words and repeated phrases are clearly audible, emerging to ignite recognition; ‘flicker’, ‘tiny’, ‘perfect’, incandescent’, ‘energy’. Much, however, is indecipherable: soundscapes which are suspended and mysterious, the articulation of meaning but a mere outward breath inscribed in the air and left to the imagination. The second room also contains a pairing. There is a display of glass objects, plates and vessels which have been hand-blown; these are glass facsimiles of the china objects used by Chinese acrobats. Placed on a table which is covered with copies of old catalogue pages depicting illustrations and facts about precious glass objects they seem strange and yet familiar. Film footage of Chinese acrobats is projected onto an adjacent wall, and it is this that becomes the focus of attention. With few seats available there is some shifting about as people jostle for a good view. The acrobats perform astonishingly impossible feats of balance, juggling, plate spinning, somersaults, tossing and catching. It makes mesmeric watching. There is a sense of poised waiting, a desire for, yet a fear of the fall that never actually comes. The acrobats are so skilled and practised, so familiar with one another that their connected bodies work intuitively together. There is constant tension between the action, the movement, the moment of the fall, and the final relief of the catch. ‘A voice can break, a flyer can fall and glass can shatter.’ Rose English. There are ephemeral gaps between words which create their own meaning; the fact that glass remains a liquid even though it appears to be a solid, and the balance of the acrobat, suspended and yet dangerously dependent, unfolds as series of connecting elements within the work. It is evident that the exhibition is a kind of documentation of some of the thought processes that have been present in much of English’s work over many years. She began working with Chinese acrobats over ten years ago and became increasingly interested in the unspoken understanding between the performers. Working in collaboration with composer Luke Stoneham to create the libretto has continued her exploration of the fragmentary nature of time and memory. The piece remains unfinished with the imagined possibility of a final performance on a scale so grand that it may not be possible. And that is perhaps part of the magic of the work: the constant hint of the impossible and the tension between what might be and what is. It is this that holds us in that moment of suspension and makes us prepared to wait and see.